I've been on a sangria kick lately and it's been my summer drink of choice. Sangria is simply combination of fruit juice and wine. There really isn't specific ratio to use of each, but that's what makes it fun and versatile. I've been experimenting with various fruit juices and nectars along with different types of wine. 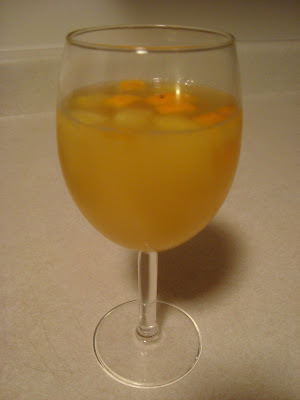 Tonight, I prepared the following cocktail using a common fruit juice and a nice Sauvignon Blanc wine. It wasn't too sweet or too alcoholic, it was just right! In a large pitcher, combine the juice and wine; stir. Add the chopped fruit to the pitcher and chill. Serve cold or over ice. Mmmm! I'd love to have that right now!